Not to worry -- you don’t have to be overflowing with professional knowledge in order to take care of many common plumbing issues, which can be solved with some basic tools that you probably have lying around the house. Read on for our guide to some of the most common plumbing issues people experience, along with how to fix them on your own, and how to know when it may be time to call in the pros. It’s possible that low water pressure could be coming straight from the source – that is, the municipal water system. If that’s the case, you’ll want to talk to the water company. But many times, the problem lies in your faucet aerator, and isn’t difficult to fix at all. The aerator is a small perforated disc, located right by the mouth of your faucet. It was originally designed to make the flow of water come out transparent and to prevent water from splashing around too much. Lately, it has also been used to help conserve water by increasing water pressure. When the aerator gets clogged, however, it can slow water output significantly. Fortunately, cleaning or replacing an aerator takes just a few minutes, and doesn’t require any special tools. Always shut the water valve under the sink before beginning a repair. Also, close the drain so you don’t lose any small parts by accident when you take apart the faucet. Wrap the tip of the faucet with some duct tape or a cloth so that it doesn’t get damaged or marked up, and loosen it with a wrench or pliers. Keeping track of the order in which the parts are stacked, carefully remove the washer and aerator. You’ll be putting them back together in reverse order when you’re finished. To clean the aerator, simply wash it with water to get all the debris off. If necessary, use a needle to poke through and clear the tiny holes in the aerator screen. Even a few blocked holes can impact your water output. If you decide to replace the aerator completely, a new one costs just a few dollars and is available at your local hardware store or online. Check your sink model to figure out the proper sized aerator for your sink. Put the faucet back together. If you are experiencing low water pressure in a shower, the shower head itself can be to blame. You can soak the shower head overnight in vinegar to help remove calcium deposits by either removing it or taping a bag full of vinegar around the head. If the problem isn’t solved by soaking in vinegar, you may need to replace the shower head. A slow-draining sink might be one of the most common plumbing issues out there – after all, who hasn’t experienced it at one point or another? Fixing a sink that’s slow to drain takes just a few minutes, and requires just a few basic tools. It’s not the cleanest or driest operation, but fixing it yourself can beat dropping big bucks on a plumber. You’ll want to have a look at the p-trap beneath the sink – that’s the curved pipe that loosely resembles the letter “p.” The p-trap is designed to always hold a bit of water. This creates a barrier preventing sewer gases from coming back up and into your bathroom or kitchen. But the p-trap also can get clogged with hair or other debris, which can prevent water from draining properly. Removing it and giving it a good clean can get your sink draining back up to speed again. Whether you’ve got a leaky faucet, a hot water issue, or a toilet that won’t stop running, Puls can take care of all your plumbing problems as soon as same-day. You can rely on us to diagnose and resolve your plumbing issue in no time. All of our services come backed by our 90-day guarantee, so you can feel confident that your plumbing service is done right the first time, and enjoy peace of mind long after. Ultimately, whether you’re dealing with a leaky sink or a bathtub that won’t drain, getting it resolved shouldn’t be a hassle. 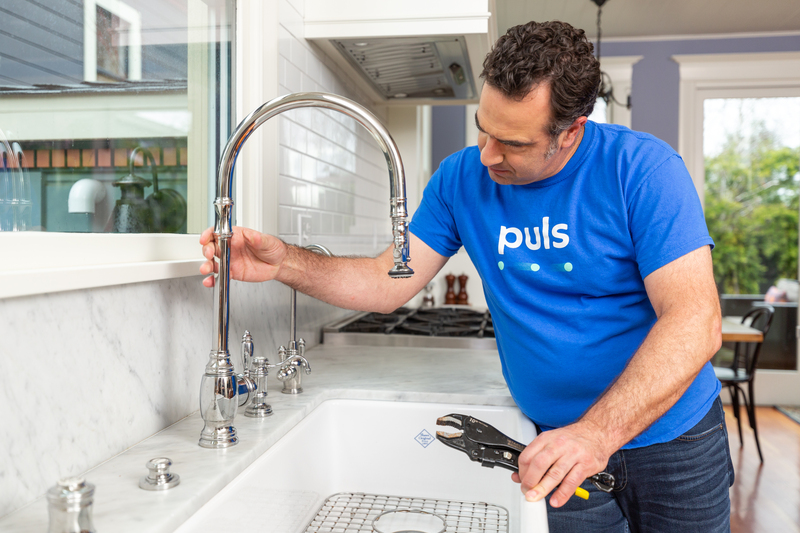 Schedule a service with Puls today, and your plumbing could be working flawlessly by as soon as tonight - it’s that simple. At the moment, our plumbing services are available in the Phoenix area, and we’ll be expanding to more cities nationwide in the near future. Click here to join our mailing list to be the first to know when we’ve arrived in your area.